The combination of whimsical art and paleontology at the Burke Museum exhibit Cruisin’ the Fossil Freeway will delight both art and science lovers. As soon as I walked in this morning I also realized it’s perfect for my 4-year-old daughter, who lists ‘digging dinosaur bones’ as one of the things she wants to do when she grows up. Also on her list: to be an artist, so she’s going to love seeing Ray Troll’s colorful art next to the real bones of dinosaurs who lived millions of years ago. 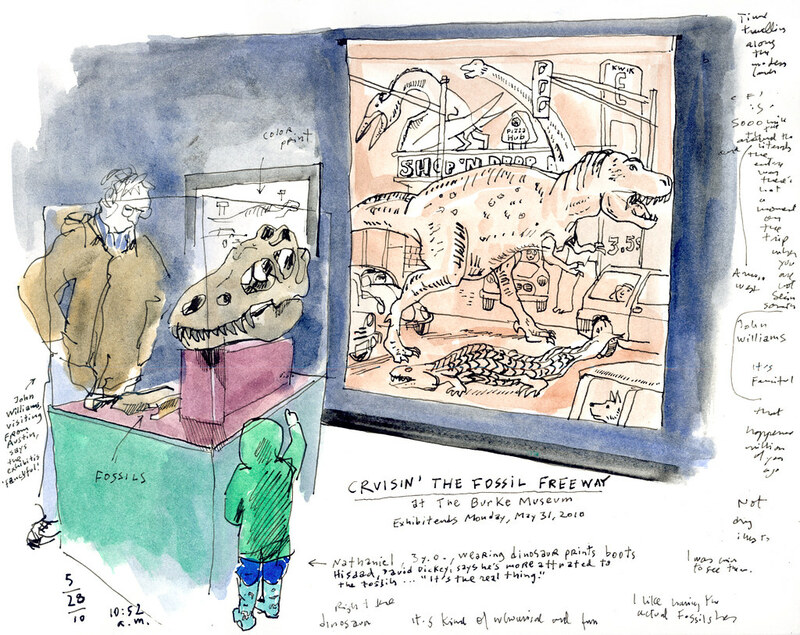 Paleontologist Kirk Johnson and Troll drove 5,000 miles across the American West imagining life in the age of dinosaurs, looking for fossils and documenting their trip with sketches and illustrations that led to this exhibit. Museum visitor David Dickey said his 3-year-old son Nathaniel was mostly drawn to the fossils, not the art. “It’s the real thing,” he said. Nathaniel seemed to be a true dinosaur fan. He showed me the dinosaur prints on his rain boots. “There, that’s a dinosaur,” he said. This weekend is the last opportunity to see the exhibit. It is open through Memorial Day.